Background: Like all facial surgeries there is going to be swelling and bruising which will persist for a longer period of time after surgery than most people want. This is certainly no less true for rhinoplasty surgery. But what differentiates nose reshaping surgery from all other facial procedures is the persistence of swelling, often lasting for months particularly in the nasal tip area. 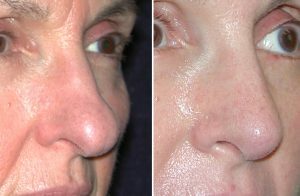 Given that one of the major motivations is to change the shape of the tip of the nose, usually for narrowing and refinement, this prolonged swelling can be both discouraging and unsettling. One anatomic feature that is known to create more nasal swelling that takes longer to go away is thick skin. Thicker skin has more tissue thickness which offers a greater reservoir for interstitial and intracellular tissue swelling. 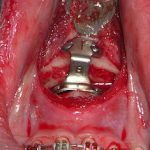 In addition its ability to contract down over a reduced/narrowed cartilage framework is more prolonged and is less prone to do so. Techniques that benefit nasal swelling is to first try and prevent how much occurs. This is the role of immediate intraoperative taping and splint application. 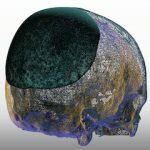 Squeezing the nasal tissues back down over the osteocatilaginous framework lessens how much swelling occurs as well as decreases fluid buildup between the skin and the framework. Early injection therapy, particularly with 5-FU, is known to help expedite nasal tip swelling. In that regard I also like to apply some topical steroid (triamcinolone) onto the tip cartilages and supra tip area before skin closure to get a head start on the recovery process. 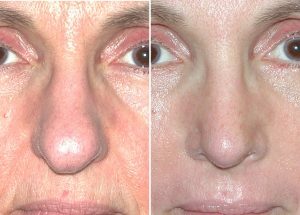 Case Study: This 58 year-old female underwent an open rhinoplasty under general anesthesia to reshape her nose, particular her large tip cartilages. Her nasal skin over the tip had moderate thickness. During her procedure a small layer of collagen soaked in steroid was applied over the tip prior to skin closure. A double layer dressing was applied consisting of glued on two layer tapes with an overlying compressive metal splint. These were removed eight days after surgery. 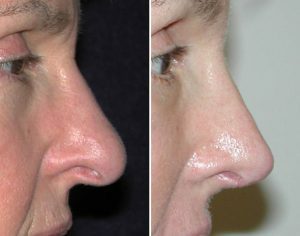 Her one month after surgery result showed good improvement in the shape of her nose particularly that of the nasal tip. The tip still had some swelling as could be appreciated by the shininess to to her nasal skin. She had no need for postoperative injection therapy given how well she was doing this early. While not every rhinoplasty patient with thicker skin can have this type of early recovery with less swelling than anticipated, maximum use of preemptive therapies for swelling reduction can be helpful. 1) Some of the major swelling and bruising after rhinoplasty can take up to three weeks after surgery to improve. 2) Nasal tip swelling can persist for up to a year after surgery particularly in noses with thick skin. 3) Good postoperative compression and easily injection therapy can help shorten the time of nasal tip swelling.